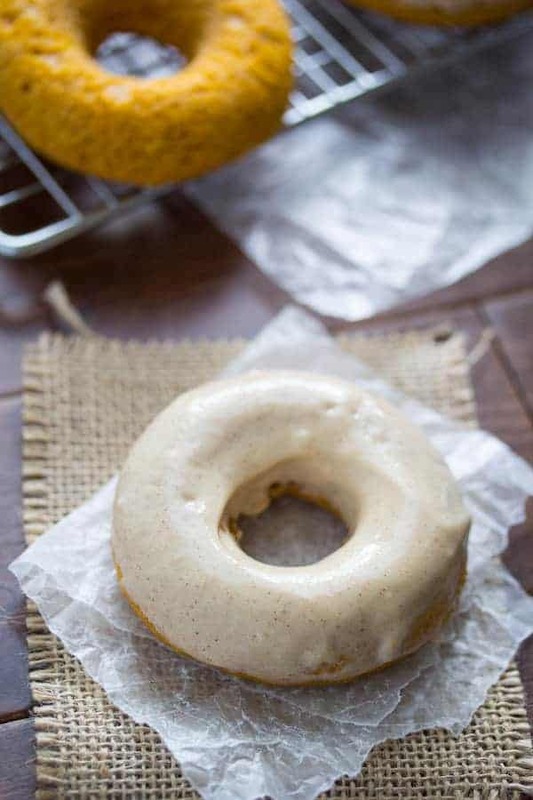 These baked pumpkin donuts are filled with fall spices, and topped with a creamy, amazing maple-cinnamon cream cheese frosting. I have another pumpkin recipe today! Let’s recap: Pumpkin Biscuits. Butternut Lasagna. And now Pumpkin Donuts. And this is coming from a non-pumpkin person. What on earth is going on?! Like any obsession, this one is just going to have to run it’s course. So here we go. Baked Pumpkin Donuts. Not just any pumpkin donuts. 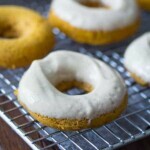 Baked pumpkin donuts with a spiced maple cream cheese frosting. And I’m not going to lie to you. These donuts are all about the frosting. I am such a sucker for cream cheese frosting. It is the entire reason I eat carrot cake. It is sweet, tangy, smooth, creamy, just so perfect. Anywho. These donuts. They are like little spongy pumpkin cakes with all those awesome pumpkin pie spices: cinnamon, nutmeg, ginger. 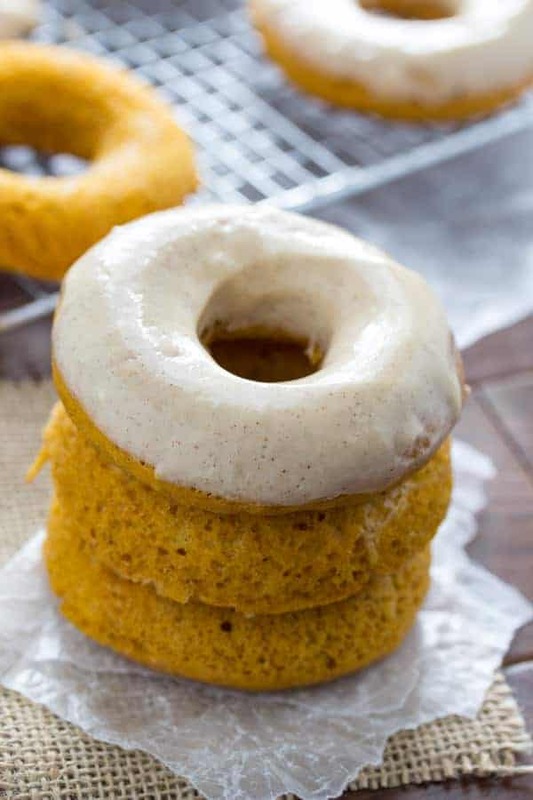 It takes about 15 minutes, if you are going S U P E R S L O W to get this pumpkin donut batter together. So. Simple. They bake up in 10 minutes. You can make these into donut holes, if you prefer, by baking them in mini muffin pans for the same amount of time. Although, I actually find the donut holes more dangerous: it is easier to convince myself to pop one in my mouth then it is to commit to eating a whole donut. So maybe I should stick to donuts from now on? The cream cheese frosting is also superduperfast to whip up, however you do need to remember to let the cream cheese come to room temperature. Uh huh. So another day, another pumpkin recipe. Happy Tuesday!! More donuts for us, eh? boozy and chocolatey…these Guinness Chocolate Glazed Donut Holes are dangerously good! These spiced pumpkin muffins are topped with a creamy, amazing maple-cinnamon cream cheese frosting. Pre-heat oven to 350°F. Grease a standard donut pan and set aside. In a large bowl, mix together flour, baking powder, salt and spices. Set aside. In a separate large bowl, beat eggs lightly, and mix in brown sugar, stirring until no lumps remain. Stir in the pumpkin, milk, and vanilla until smooth. Mix the wet ingredients into the dry and mix until smooth. Spoon into the greased donut pan, filling ⅔ full. Bake for 8-11 minutes, until donuts spring back to the touch. Cool 5 minutes in pan, then transfer to a wire rack to cool completely. Combine all ingredients in a medium bowl, beat until smooth. Do not frost donuts until just before eating. Donuts will keep in a sealed container for up to three days, while frosting will keep in the refrigerator. Oh! I should note, however, that the icing is absolutely delicious. I’ll happily be devouring that on my leftover pumpkin bread I made the other day. These were a disappointing disaster for me 🙁 I’ve been making different donuts recipes for weeks ever since I got my tin, and was quite excited to make pumpkin donuts for our bake sale at work tomorrow. To my surprise, I pulled these out of the oven and they were each a flat, lumpy mess that had failed to rise in the slightest. I absolutely don’t understand it – all my ingredients are fresh, so I’m not sure what the problem is! I’m gonna have to make something else last-minute. A big shame and waste of ingredients. Hi Trista, I’m so sorry to hear that the donuts didn’t work out for you! I tested the recipe three times and they worked great. I will try it again to make sure nothing was lost in translation. I’m suspicious of the quantity of milk but can’t find my notebook. I really hope I didn’t make a typo. I will report back. Hi Trista, I have retested the donuts, and I’m afraid I made a typo in the recipe….it should say 1/3 cup milk, not 1 cup milk. I am so sorry for this mistake and that you ended up with such terrible donuts. Thank-you for letting me know about the problem. Yay for pumpkin and these donuts! They look absolutely amazing! Love the cinnamon cream cheese glaze too – it’s perfect! Ha ha, yes, Terry! No such thing as too many donuts, is there? Thanks, Jess! They did end up a nice pumpkiny orange, didn’t they? I am speechless. These look incredible! I love the idea of baked donuts instead of fried. I’m so glad you mentioned the option to use a mini-muffin pan for the holes, since I don’t have a donut pan. Andrea, thank-you! I don’t do fried donuts…giant pots of oil scare me! And I highly recommend these in mini-muffin form, although like I said, they are almost more dangerous that way. 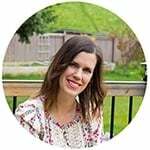 No need to apologize for loving Maple Syrup and saying ‘eh’ after ever sentence! I totally understand, eh! 🙂 Even after moving away from Canada Maple Syrup still sneaks its way into everything I make and ‘eh’ naturally pops out when I’m chatting!! 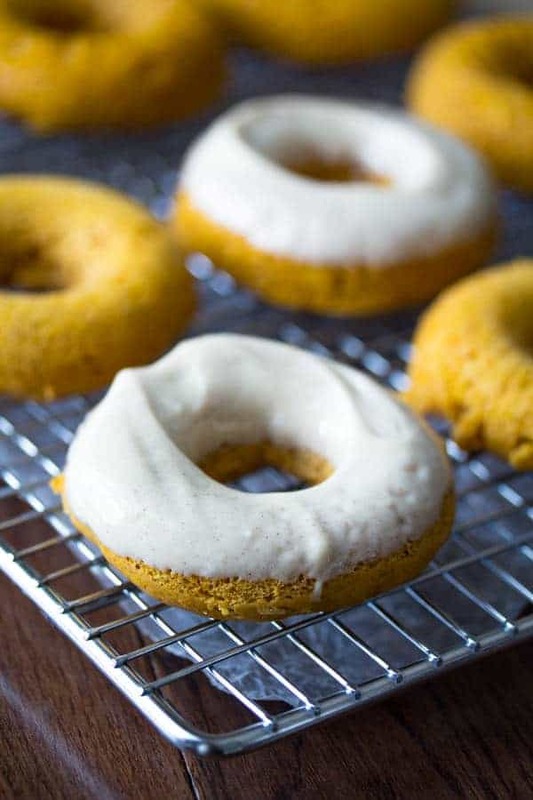 I am in love with these pumpkin donuts they look absolutely amazing and perfectly spiced! I cannot wait to try these very soon! Pinned onto my Pumpkin Board! Apparently I am really bad for the ‘eh’ thing! That’s great you haven’t lost your Canadian-ness! Thanks, Ceara! Please have nobody stop you! I love that you’re on this pumpkin kick – makes me feel like I’m not alone ;). The cream cheese frosting looks to die for! 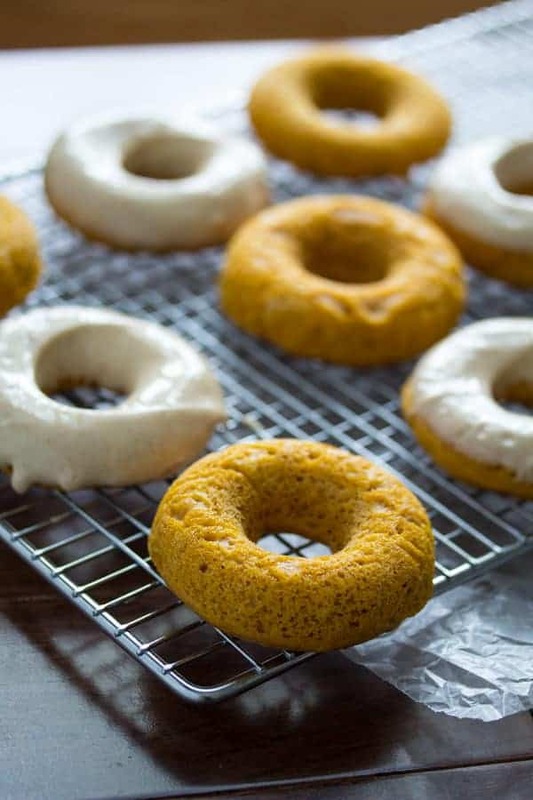 These pumpkin donuts look incredible, Denise! 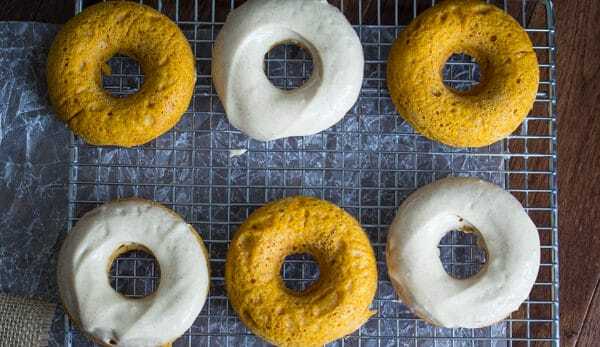 I just made some pumpkin donuts a few weeks ago (but am waiting to share for another two weeks), so I know how delicious these babies are! I will definitely have to try out your recipe! The maple cinnamon frosting sounds so delish, I’m not sure it would make it onto my donuts. Pinning! Ooh Gayle, can’t wait to see your pumpkin donuts! And you are organized to have a post ready 2 weeks ahead of time! The donuts look perfect but it’s that glaze….pass the spoons 🙂 Pinned! Thanks so much, Averie, I was definitely eating the glaze off a spoon 😉 Thanks for pinning! I love everything about these – love the color, love the frosting, love that they are so easy to make and love that you bake them. Pinning to try soon. Great pictures – especially the tic tac toe one! Thanks, Denise. Don’t stop! Keep putting pumpkin in all the things! These donuts sound amazing. And they’re ready in less than 30 minutes? Gah! Can’t wait to make these beauties! Imagine how awesome these would be with a Pumpkin Spice Latte, or just a good cup of coffee! Gosh I want these for breakfast every day! Ohhhh my gosh! I am obsessed with these! I have not broken out the pumpkin yet, and I AM a pumpkin person! It is still so warm here I am kind of waiting for the first day that really feels like fall. But, I am not sure I can wait now! That maple cinnamon cream cheese frosting sounds incredible! I would probably hold off on the pumpkin if it didn’t feel like fall here, but it is fall for real! Can’t wait to see what you cook up when you finally break out the pumpkin, Annie!